"This recipe has been handed down in my family and has become a favorite. 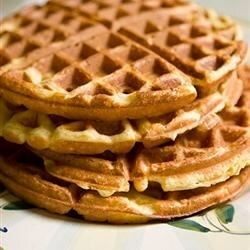 If you have leftover waffles, they are great to freeze and then toast at a later time. I usually make a double recipe and then have plenty of leftovers for the kids to have for breakfast before school." Whisk the flour, baking powder, sugar, and salt together in a mixing bowl; set aside. Beat egg whites until foamy in a separate large glass or metal mixing bowl. Whisk the egg yolks, lemon zest, and vanilla extract together in a third bowl; whisk in the milk. Stir in the flour mixture until smooth. Fold in the melted butter and then the beaten egg whites until just incorporated. Cook the waffles according to manufacturer's instructions until golden brown.